Leave a Comment on Litecoin Will Be Back? In the last couple of months, Litecoin has shown an incredible increase – 183%. The price growth is accompanied by even more stable growth in trading volumes. And this is not some kind of volatility. – Ok, sorry to spoil the party, but I need to reign in the excitement a bit… Buying LTC is extremely risky. I expect us to have a multi-year bear market like the one we just had where LTC dropped 90% in value ($48 to $4). So if you can’t handle LTC dropping to $20, don’t buy! Then his words sounded like a bolt from the blue. But he did not just predict the price. Charlie sold all his Litecoins at the highest price! Amazingly, it was to this level that LTC dropped a year later: to $ 23.42, on December 14, 2018. Such accuracy is not just an insight. Surely, LTC CEO knows something about his coin that others do not know. We try to figure it out. Litecoin is one of the first hardforks of Bitcoin. In fact, it is not much different from BTC. But these small differences result in significantly higher speed (4 times compared to BTC), as well as certain difficulties for mining on ASIC and more suitable conditions for PC miners (due to the function of finding the hash, scrypt instead of SHA-256). But the main thing for users is near zero transaction fee. As it turned out, a policy of increasing the LTC capitalization is being built on this fundamental basis. 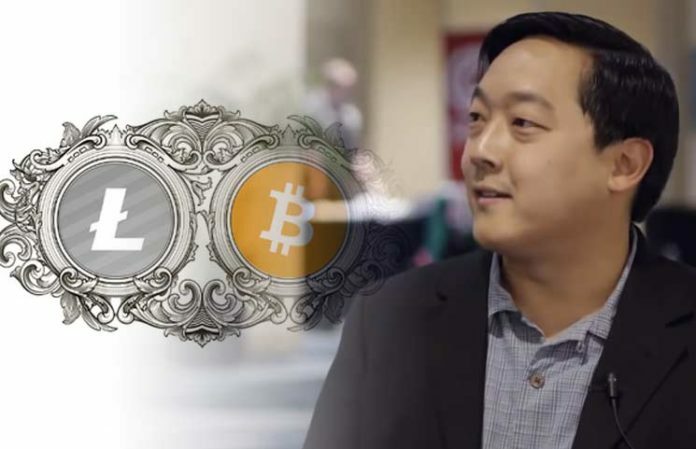 In fact, Charlie Lee constantly follows advanced technologies in crypto and does not allow his brainchild to become obsolete. When the SegWit soft fork appeared, Litecoin was one of the first that implemented it. SegWit significantly increases blockchain bandwidth by changing the structure of the data in the block and the mechanism for verifying transactions. After activating SegWit in April 2017, the LTC rate began its growth, and didn’t stop until the peak on December 19, 2017 at the level of $ 364. When the Layer 2 Lightning Network (LN) protocol appeared, LTC developers immediately became interested in it. Although LTC is just less than others to be in need of such an improvement, since its blockchain is quite fast, and transactions cost almost nothing. LN is invented to conduct instant transactions between nodes on top of the blockchain. Lightning Network consists of nodes and bidirectional transaction channels between nodes. Now LN is booming. Over the last month, the number of nodes has grown by almost 20%, and the number of channels has increased by almost 40%. LN now has over 7 K nodes and 32 K channels. The Litecoin network has been operating for 162 years and over 1000 channels. And Charlie Lee is trying to keep up with trends again. According to him, on the agenda is fungibility and privacy: Another change that Charlie Lee plans is halving the rewards for miners. Such an operation always increases the rate of coins, since it means a certain shortage of them. Halving LTC is expected in the next six months. And that is not all. There is a certain leak – in the report of the investment dealer SFOX – that the Litecoin Foundation is exploring the integrating the MimbleWimble protocol, which just gives the blockchain new opportunities for the very same fungibility and increases confidentiality. 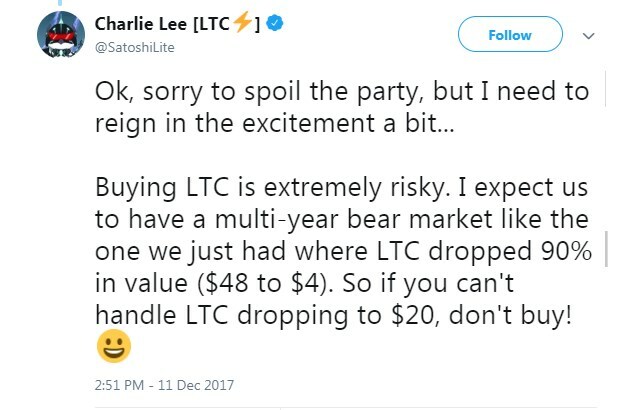 Obviously, such serious plans give grounds for Charlie Lee to declare that LTC will rise to the level of $ 300 and, accordingly, is ready to displace XRP from the third line on capitalization! Wonder if he guesses this time? Previous Entry Who and Why is Beating Bitcoin? 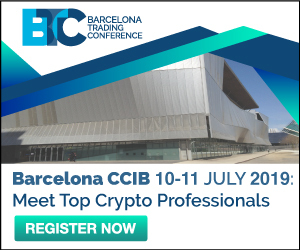 Next Entry Will Binance Coin (BNB) Grow on ICO Celer (CELR)?